We began our vineyard development by researching the great grape growing and wine producing regions of Europe. After comparing climate and soil, we settled on the Shenandoah Valley of Virginia—an ancient seabed of generally limestone soils. The northern end of the valley enjoys a rain shadow from the prevailing westerly winds descending the Appalachians. It routinely receives the lowest summer rainfall in the state, while providing acceptable risks of late spring and early fall frosts. 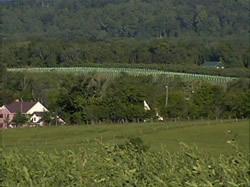 This part of the valley is the tree fruit capital of the state. Because of its low humidity, the area experiences substantial diurnal temperature variation. The low nighttime temperatures that often begin in early September help to maintain the acidity need for a balanced, complex wine tasting experience. 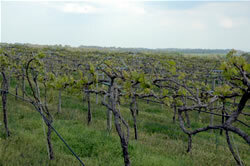 Our properties currently consist of 2 separate vineyards, totaling 20 acres with a third vineyard planned for 2010. The varieties for each have been especially selected for the soil conditions there. Our first vineyard, Opequon One, is planted with one Italian (Barbera), one French (Cabernet Franc), and one German (Riesling) variety. 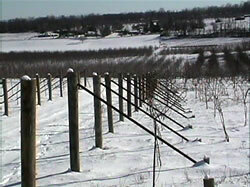 Our second vineyard is given over to French American hybrids (Traminette, Chambourcin, and Vidal). Our third vineyard will be devoted to classic Italian red varieties—Sangiovese (of Chianti fame), a Brunello clone, and Nebbiolo (the grape of Barolo and Barbaresco wines).